Let's do this, Vampire Diaries fans! Let's play another edition of The Vampire Diaries Caption Contest. And... we're back! Ready to play a new edition of The Vampire Diaries Caption Contest? Let's do this, Vampire Diaries fans! It's time for another Caption Contest! We're finally back with a new edition of The Vampire Diaries Caption Contest. Play to win now! We've reached the 160th installment of The Vampire Diaries Caption Contest. Play to win right now, TV Fanatics! Let's do it once again, Vampire Diaries fans! Weigh in now with your very best photo caption! Let's do this, Vampire Diaries fans! Weigh in now with your very best photo caption! Do you have what it takes to win The Vampire Diaries Caption Contest? Good luck! We have returned with a new Vampire Diaries Caption Contest. Stop what you are doing and play now! The Vampire Diaries Caption Contest: Prom Edition! The Vampire Diaries takes us to the prom later this month. Caption a photo from the episode now. Sound off now, Vampire Diaries fans! It's time for a new Caption Contest. Attention, Vampire Diaries fans. We are back with a brand new caption contest. Good luck! Damon: You know what they are? Children. Like lighting a candle's going to make everything OK, or even saying a prayer. Or pretending Elena's not going to end up just like the rest of us murdering vampires. Stupid, delusional, exasperating little children. And I know what you're going to say: 'It makes them feel better, Damon.' So what? For how long? A minute, a day? What difference does it make? Because in the end, when you lose somebody, every candle, every prayer is not going to make up for the fact that the only thing you have left is hole in your life where that somebody that you cared about used to be. And a rock with a birthday carved into it that I'm pretty sure is wrong. So thanks, friend. Thanks for leaving me here to babysit. Because I should be long gone by now. I didn't get the girl, remember? I'm just stuck here fighting my brother and taking care of the kids. You owe me big. Alaric: I miss you too, buddy. Dear Diary, a chipmunk asked me my name today. I told him it was Joe. That lie, will haunt me, forever. 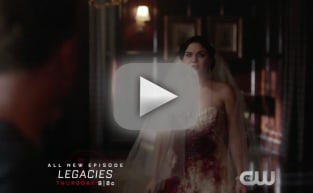 Legacies Promo: A Favorite from The Vampire Diaries Returns!